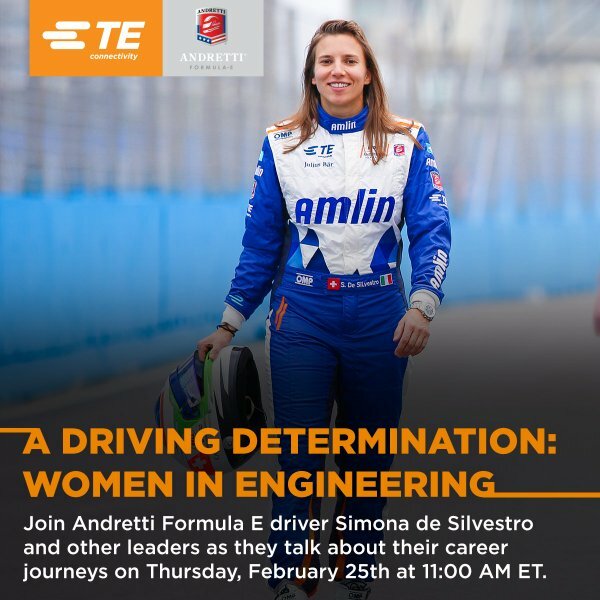 Andretti Formula E driver, Simona de Silvestro will be sitting on a special A Driving Determination: Women in Engineering panel to speak about her career journey as part of sponsor TE Connectivity’s Engineering Week festivities. The field of engineering is changing our world every day, and women working in engineering can be powerful role models for young girls pursuing an education and career in science, technology, engineering or math. Through this panel, TE Connectivity (TE) celebrates and recognizes the role women are playing in engineering today, including the unique challenges they face. Each of the six panelists have found success in their chosen fields and will talk about their own journey to finding their passion. Andretti Formula E driver Silvestro will impart her experiences as a five-time Indianapolis 500 participant, and what it is like to be the only current female driver in the Formula E series, the international electric car racing platform. Register Online for access and more information.